Yes, life sometimes gets in the way of my blog posts; rather than keep you waiting for a fully referenced article I was hoping to post as follow up to the new recommendations to address childhood obesity, issued jointly from the AMA, CDC and HHRS, I'm going to keep this short and point first to a massive, 400+ page, document - Preventing Childhood Obesity: Health in the Balance - published in 2005 by the Food & Nutrition Board (FNB) of the Institute of Medicine (IOM) that painstakingly reviewed the evidence published regarding childhood obesity. "...problem exists, causes less clear..."
"...little clarity about the relative importance of possible causitive factors..."
"...a robust evidence base is not yet available." "In reviewing the available evidence to inform this report, there was an abundance of scientific studies on the causes and correlates of obesity, but few studies testing potential solutions with diverse and complex social and environmental contexts, and no proven effective population-based solutions." But that's okay, let's press forward without hard data; the latest AMA recommendations seem to have ignored the above lack of data and even ignored that the IOM document specifically states that within their publication there is "limited literature upon which to base these recommendations..." and chose instead to concentrate on "...parallel evidence from other public health issues..." to side-step empirical data and move forward to modify public opinion anyway. "Now that the nation has begun to realize the significant health, psychological and societal costs of an unhealthy weight, it is time to re-examine its way of thinking and revise the social norms that are now accepted." "In the absence of precise understanding of the eitology of the problem, it may be useful to look at the lessons learned from other public health campaigns and to try and determine if these lessons have any relevance for the prevention of childhood obesity." Their playbook to resolve childhood obesity? Lessons learned from tobacco control, seat belt enforcement, underage drinking, childhood vaccination, and regulation of speed limits; with the most notable precedent examples throughout the section on Lessons Learned from Public Health Efforts and their Relevance to Preventing Childhood Obesity being the stunning success of tobacco control initiatives, that now leave smoking, in the minds of the majority of society, "nearly considered, if not deviant behavior, at least one in private;" and they note the magnitude of the change in public perception of smoking over the years of gradual change, from a time when smoking was viewed as a private matter, to now when smoking is viewed as a moral failing and deviant behavior. They note, "Culture is not a static set of values and practices," and that programs to prevent and reverse obesity need to balance "the role of coersion versus the individual." How they fail to see the under-current of shame and moralizing a behavior like smoking is scary. We're going to now do this with children, kids who happen to weigh too much for their age and height? Have we lost our minds? Oh, it just gets better though. Notice above, the critically important factors are not solid evidence, but persuation, packaging the message for the media to propogate to the public, repeat the message through advocates and champions, and regulating laws and policies to conform to the pursuasive messages. That's not science, that's carefully orchestrated propaganda. This is what public health experts intend to do to our children. "Tough choices will have to be made at all levels of society. There will be trade-offs in convenience, in cost, in what's 'easy', in pushing oneself and one's organization, in choosing between priorities, in devising new laws and regulations, and in setting limits on individuals and industries." The second document I'd like to direct your attention to is from the US Preventative Task Force, published in 2006, Screening and Interventions for Overweight in Children and Adolescents: Recommendation Statement. It states, "There is insufficient evidence to ascertain the magnitude of the potential harms of screening or prevention and treatment interventions. The USPSTF was, therefore, unable to determine the balance between potential benefits and harms for the routine screening of children and adolescents for overweight." Now, in 2007 - with no new science and still no compelling evidence, no empirical data, absolutely nothing more than "hope" this will work, the AMA, CDC, and HHRS is jumping in with both feet, and expects all of us to do the same; expects we'll all get on board, full steam ahead with little more than our fear that if we do nothing, our kids are going to die prematurely; anything is better than nothing. Except that anything is may wind up destroying our children in the long-term. But hey, they won't be fat, right? "There will be in the next generation or so a pharmacological method of making people love their servitude and producing dictatorship without tears, so to speak, producing a kind of painless concentration camp for entire societies so that people will in fact have their liberties taken away from them but will rather enjoy it ... [through] brainwashing enhanced by pharmacological methods." "Scientific societies are as yet in their infancy. . . . It is to be expected that advances in physiology and psychology will give governments much more control over individual mentality than they now have even in totalitarian countries. Fitche laid it down that education should aim at destroying free will, so that, after pupils have left school, they shall be incapable, throughout the rest of their lives, of thinking or acting otherwise than as their schoolmasters would have wished." "Diet, injections, and injunctions will combine, from a very early age, to produce the sort of character and the sort of beliefs that the authorities consider desirable, and any serious criticism of the powers that be will become psychologically impossible." Total = $4,312; $82.92 each week; $27.64 per person each week. Had this been any other point in time, compiling the list might have been impossible; last year when we moved here, I started to keep track since our food purchasing habits changed as we joined a CSA and started ordering meat, poultry, eggs and such directly from local ranchers. While we lived in northern VA, I was easily spending $150 a week, but wouldn't be able to break down where the money went by food type. Sorry, I'm just not that obsessive! Here, living in mid-Missouri, tracking my spending by food type is rote, it's how I order much of what we consume, so understanding where I spend on food is much easier here than in Virginia. Something that I do need to note: what this does not include: our meals in restaurants or take-out eaten at home (we average once a week, one meal out/take-in); and meals while on vacation or attending conferences. This, I think, is important to point out because, if this is considered into the above figure, our total cost for food is truly higher, almost double, since we average $25 a week for meals prepared outside our home, and budget $75-100 a day when traveling for meals (with an average 28-days a year on vacation and attending conferences). If I include that $1300 for meals out/take-in [25 * 52] and $2100 for meals while traveling [28 * 75], we're looking at $7,712 for food each year; $642.66 per month; $148.30 each week; $49.43 per person each week. And, no, I really don't want to do the math to see how much I really spent while we lived in VA - it's too frightening to think about since I know it's significantly more than we're spending here in mid-MO. So how to reconcile the budget if I did prepare each meal, at home or while traveling, from purchases throughout the year - that is no meals from restaurants or take out, and no need for vacation/conference eating out since all meals are from what we purchase; a more realistic budget of $4920 is needed to maintain our almost exclusive organic/pastured dietary habits throughout the year here in mid-MO. I arrived at this figure by taking a year - 365-days - and subtracting our current average of 28-days traveling to arrive at 337-days; then took 52-days, divided it by 3 (meals each day) to arrive at 17-days; then subtracted that from 337 to arrive at 320 days - the days of meals provided in my budget above. I then divided the budget [$4312] by 320-days = $13.48 per day for meals we eat from the above budget. I then multiplied that sum by 365-days (in a year) to arrive at what we'd need to spend if we consumed all meals prepared by ourselves without any from restaurants. So if $4,920 is truly more representative of what it would take to eat all meals, then we're looking at $94.61 each week, or $31.54 per person...to eat an almost exclusively organic/pastured diet; here in mid-MO. Now granted, the way I do save considerable money requires first, a good, big upright freezer; next bulk purchase of meats/poultry/game (30-100+ pounds at a time) and then enough money on-hand to purchase major quantity when something expensive is on sale (like butter or oils - for example, right now I have close to 25-pounds of butter in the freezer). Add to this, a membership in a CSA, while over time saving money, requires an up-front payment for the season (or you pay more if you pay with the payment plan; and out here there is no weekly or monthly payment plan - when you use the payment plan of three payments, it increases the total cost for the season by $50). So, each of my "large sum required" ways to save a lot of money in the long-term makes it next to impossible for someone who is receiving assistance to do the same thing. I think this is one flaw in the current system that can and should be addressed - to me it makes sense to make funds available to allow recipients to utilize local sources, like a CSA or Farmer's Market or rancher, if it's saving more to do so than force the purchase at retail prices each month. I don't think any of the CSA's in this area are equiped to accept EBT payments; even if they were, the up-front cost for membership would be prohibitive since those receiving assistance cannot "borrow" from future assistance to pay for an on-going source of fresh produce. So while a CSA membership costs about $18.75 each week (32-weeks) for a family of four, and would be a very cost effective way to ensure weekly fresh, local produce to recipients, it's not possible with how the system is structured today. Forget about trying to purchase meat or poultry in a large enough quantity to have a discount extended for bulk purchase; and totally forget about the significant savings when someone is able to buy a split-quarter or half, which makes meats and poultry cheap, cheap, cheap when compared to retail. Again, it's too much money up-front for someone receiving assistance to manage, even though long-term it saves significant sums of money. Those receiving assistance, even when they have the room for one, cannot use their budget to purchase a freezer - which would enable them to purchase larger quantity at a lower price! The way money is currently made available also makes it next to impossible to stock-up on non-perishable foods (like canned vegetables & fruits, canned tuna/fish, peanut butter, etc.) when sales are favorable to a large quantity purchase, that over time saves money. Anyway, for those of you who wanted to know how I manage to spend what we do each month on a mostly organic/pastured diet, there you have it. With the weekend to gather my thoughts about our experience last week doing the Food Stamp Challenge, I'm left with more questions than answers, and no solutions that seem realistic to improve the situation where millions are struggling to feed themselves on what seems like a paltry sum - an average $3.00 a day per person. As I learned, it is possible to feed a family within the budget a varied, nutrient-dense diet and even have food left at the end of the week. When I started to put together a menu and shopping list from the area stores' sale circulars, I thought it was going to be next to impossible to get everything we'd need for the week - I was surprised with the ease with which I did put together a menu, list of things on sale and the rest needed as 'fill-in-the-gap' items not advertised, and was able to buy everything for the week without much fuss. We even had food left at the end of the week - enough to more than start the next week and ease the stress of staying within the budget. As some have noted in comments and email - I'm at a distinct advantage, I know which foods are nutrient dense and how to plan a menu, so it's not realistic, let alone reasonable, to expect someone without my specific background to be able to replicate my success in meeting the challenge. Some even emailed me links to show how pitiful some did when they tried to do the challenge. I hate to say it, but posturing politicians aren't a great example of failure to succeed in the challenge. Their success is likely tied to their position on the issue - those who are in favor of increasing the assistance more likely to fail miserably than one interested in maintaining the status quo or reducing the budget. What I found when I poked around the blogosphere is that those without a vested interest either way, like me, were able to stay within the budget constraints during the week and seemed to do well with a little planning. Those who are strongly in favor of increasing the money provided did poorly. Coincidence? Who knows; but had congressman Ryan been trying to live on the DC budget - $31.30 average - and really planned better, he could have fared better than he did. But, that wouldn't have made headlines and would have been counter-productive to increasing the budget to provide more money to families needing assistance. That's not to say that the assistance currently provided is great; it's not. It definitely does not allow a family (or individual) to buy whatever, whenever they'd like. Heck, without some planning you won't get through the month - plain and simple. Even with planning you still won't have lots of goodies or all the convenience more money does provide one with. While I was able to stay within budget, there were no ready-to-eat snacks, beverages (other than calcium enriched V-8), or packaged, quick to grab-and-go foods. The budget forced planning, creativity and cooking each day - something no amount of money will inspire someone to do unless they see the value of their time as fundamental in managing on their budget. While it's infinitely easier to grab a bag of pre-cut and washed lettuce than to wash and chop it yourself, the convenience comes at a steep premium - an average bag of lettuce (romaine) weighs 8-ounces and is often on sale for 2-for-$5.00....reality check - that's $5.00 per pound; head lettuce (romaine) goes for anywhere from $0.99 a head to $2.49 a head. Last week I weighed the two heads I purchased - one was about 1.75-pounds, the other 1.25 (green and red leaf respectively), so I had 3-pounds of lettuce that cost me $1.39 a head (total $2.78, or 0.92/pound). If I purchased the amount of lettuce we ate throughout the week, already washed and chopped for me, I would have needed 6-bags to have 3-pounds of lettuce - at 2/$5 that's $15 - or, put another way, 47.6% of the budget for the week for a family of three. Doing the washing and chopping myself left $12.22 in the budget for other foods. So, I'm left wondering, if $21 per person each week isn't enough, how much is? Is it $25? $30? 40? More...? How much is enough? When I poked around various state websites, detailing program funding in different locations, it's clear where you live matters in how much is provided. For example, here in Missouri and in neighboring Kansas, the average assistance is about $21 per person per week; but in areas that have higher cost-of-living, the amount can be as high as $38.75 per person each week. What I did find shocking was that, according to Harvesters website, "Harvesters clients who receive Food Stamp benefits indicate that their monthly allotment lasts just 2 ½ weeks." So, if my math is correct, a family of four - who receives an average of $21 per person per week - receives an average of $364 a month for a family of four. Based on the Harvesters finding that this amount provided for only 2.5 weeks in a month - are we to believe a family of four needs an average assistance with $582.40 a month instead of the current $364 each month? Do those needing assistance need 60% more each month to feed their families? I don't know about you, but even we don't spend that much on average over the year, and I'm not exactly what you'd call thrifty when it comes to grocery shopping. In fact, I've heard many, many times from my much-more-cost-aware husband that I'm spending way too much on groceries! So, I sat and calculated out our food costs, based on actual buying through the year, and between May 2006 and May 2007 we spent $4300 on food, including almost exclusive purchase of grass-fed pastured beef, chickens, turkey, pork, lamb and eggs; dairy from milk of pastured animals (including goat milk products); milk, fresh produce, oils, butter, and miscellaneous purchases at various grocery stores and produce when the CSA and Farmer's Market isn't providing fresh local vegetables and fruits. Why are we not asking how we can help folks learn to budget better? When the same folks are coming through for additional help each month, maybe it's worth our time and effort to sit and listen, help them learn where they can make changes to their current buying practices to stay within their budget next month? It's easy to call the problem "not enough money" and just give them more money - but seriously, after doing it for a week, I'm not surprised we managed well - what I spent isn't that much less than I normally do on a weekly average! So, I'm not convinced more money given to those who do need help is going to change much for them, or be the panacea that fixes the very real problems inherent in the existing system. More money won't solve transportation problems. More money won't relieve predatory pricing - it may even provide incentive to not only continue predatory pricing, but increase prices to eat up the additional dollars provided just as quickly. More money won't buy access that isn't already there for fresh fruits and vegetables. More money won't solve poor dietary habits. More money won't solve time management issues. More money won't incline people to cook more from scratch. And, I hate to say it like this, but more money won't make people better planners - if someone today isn't thinking far enough ahead to budget for meals for a month, more money isn't going to change short-sightedness and failure to plan ahead when it's not in practice now. After years as an IT professional, I can say with certainty, the saying "throwing more money at system problems makes them worse" is true. I hate the idea that people are hungry and malnourished in the United States. First, a correction - when starting the week and shopping, I didn't know that those receiving assistance do not pay tax on food purchases. So my going over budget wasn't actually $4.93 as I originally thought, but was $1.99 - that I'm now sure was due mostly to my purchase of spices and condiments it's been argued elsewhere most would have some of on hand, since it's rare someone is starting with absolutely nothing in the pantry. 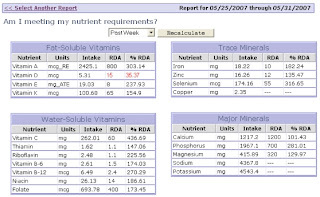 Bigger question - did the food eaten during the week meet nutrient requirements? You can see from the FitDay tracking, that with the exception of Vitamin D, I met all nutrient requirement RDA's. This time of the year, for most Americans getting out into the sunshine sans sunscreen, vitamin D isn't an issue - we make it in our skin from exposure to ultraviolet rays from the sun. I did lose three pounds during the week, yet wasn't hungry! In reviewing my macronutrient intake I found my calories were lower than usual - I ate an average of 2,330-calories each day, when I need about 2,600 a day to maintain my weight. The calorie deficit of 270-calories each day explains about a half-pound of the weight loss (1890-calories over seven days) and I'd speculate the remaining 2.5-pounds was the dual effect of water loss and a higher than usual intake of protein, with the protein boosting the thermic effect of food consumed. Whatever the reason, three pounds? I'll take it! Carbohydrate intake each day averaged 97g carbohydrate, with 24g fiber, so 73g net carbohydrate; and my protein was higher than usual, averaging 142g protein each day. I usually eat about 100-125g of protein each day, so the higher protein intake is also likely to be a contributor to my satiety with less calories. Well, we're into the home stretch - vegetable omelets for breakfast with bacon; tuna salad (celery, onion, mayo) on a bed of lettuce, cucumber, shredded carrots, walnuts and dressing; with dinner to end our day - a dinner salad (baby spinach, romaine, shredded carrots, cucumber, tomato, dressing) and chicken chili, topped with a dallop of sour cream and shredded cheddar cheese. And yes, in the picture, my son's hand is reaching for his additional item on the side - some cantaloupe. 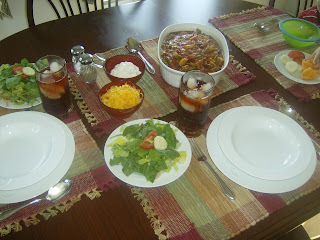 My use of chicken for chili started a few years ago, when a dinner out included a cup of chicken chili - a medley of vegetables, spices, beans and chicken - unlike any chili I'd had before...it was insanely delicious! I don't have any particular set recipe to make it - it's just basics that I start with and is a great way to use up leftover vegetables that sometimes collect in the refrigerator throughout the week. You know what I'm talking about - the two tablespoons of spinach, the half-cup of broccoli, the scant onions and peppers, etc. - the veggies you won't bring yourself to toss while clearing the table from dinner (and shouldn't), but the amount isn't really enough for a side at another meal. I use these leftover vegetables often, in omelets, but even that doesn't always get them eaten fast enough. So, chicken chili (or other "stew-like" dish) is a great place to add them and boost nutritional value of a meal without much fuss. When I make dishes like this, I usually start with more fresh ingredients, but since I was working with what was on hand for the week, here is what I wound up doing to make the meal. The small 3-pound chicken went into a pot of water to cook slowly. This provided not only the meat for our chili, but also provided a rich stock for future use. When the chicken was done, I simply removed it from the water and let it cool while I started another pot (the stock was also set aside and cooling). The burner was on medium heat and into the pot went a can of diced tomatoes, a jar of picante sauce, 1/2 packet of taco seasoning, 1/2 onion chopped chunky, 1 carrot diced really tiny, the green pepper tops I'd saved from when I made the stuffed peppers - chopped medium/chunky, 1-cup V-8, the leftover zucchini, tomatoes and onions from the night before, and 2-cups frozen green beans. After stirring that all together to simmer and cook, I took all the meat off the chicken and diced it up. After I waited about 15-minutes for the vegetable mix to simmer and cook, I added about 2/3 of the chicken meat to the mix, along with one can of drained, well-rinsed red kidney beans and left it to simmer and cook. When it was ready, it was served with grated cheddar cheese and sour cream for topping. What's great about this recipe is that it's not dependent on any particular vegetables, other than the tomato base - whatever vegetables are on hand are used and you can let your imagination go - it's all good! Today's breakfast is eggs and bacon with a side of strawberries (the last we have for all of these foods), and lunch is going to be leftover chicken chili. So that wraps up the week, and we do have food left. I'll follow-up with some thoughts later.